The Cast of JOURNEY TO THE WEST. Photo: A.R. Sinclair Photography. CAMBRIDGE – Once again, the Central Square Theater will be transporting theater-goers to distant lands for the holiday season. After the five-year run if the award-winning adaptation of “Arabian Nights” ended last year, the Nora Theatre Company and the Underground Railway Theater – the two resident companies in Central Square – have combined for a production of “Journey to the West,” an adaptation of the classic Chinese novel by Tony Award-winning playwright/director Mary Zimmerman. “Journey” is the story of the legendary pilgrimage of Buddhist monk Tripitaka (Jesse Garlick) who travels across China to India in search of Buddhist scrolls that will lead to the enlightenment of his people. Along the way, Tripitaka will pick up three fellow passengers/disciples/protectors: Sun Wukong, also known as the Monkey King (Lynn R. Guerra); Zhu Wuneng, a pig with special powers (Shane Burch); and Sha Wujing, (Harsh J. Gargoomal) described as a “monster,” which seems a bit unfair to the character, who admittedly is no shining star. All agree to aid the monk to atone for their misdeeds. Alas, this “Journey” takes quite a while to get moving, with much of the early going devoted to the travails of the Monkey King, winningly played by Guerra as a bundle of comic energy, who emerges from 500 years in captivity to become part of the journey. The disciples are recruited and and given their names by Guanyin (Jordan Clark) , the Goddess of Mercy, a divine being in the Chinese culture who hears and helps those who cry out in need, and she provides the help for Tripitaka. The journey is the stuff of myths, legends and rewrites through the centuries and emerges here as an 108,000 mile trip that takes place over 14 years and includes such tasks as an 800-mile river crossing. Just in case you missed the obvious connection between this incredible journey and another such trip, there is a brief reference to L. Frank Baum’s “The Wizard of Oz,” which featured another pilgrim named Dorothy. Zimmerman has adapted many works for the stage, including “Candide” and “The Jungle Book,” which were performed at the Huntington Theatre Company, but this piece could still stand a shave and a haircut that would make it more accessible to younger theater-goers and those who come in with little knowledge of Eastern cultures and religions. 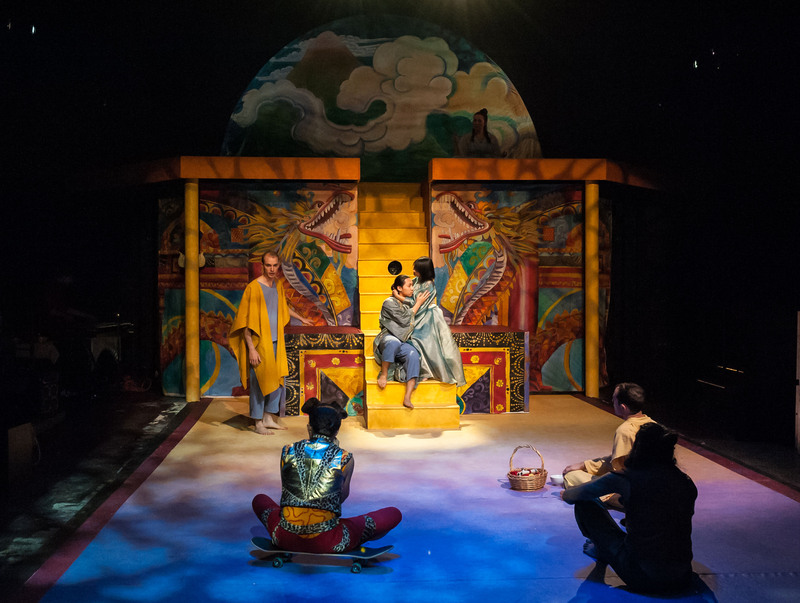 One of Central Square’s strong points is its dramaturgy, however, and lobby exhibits connected to the show offer graphics and charts that serve as a primer for those experiencing the story for the first time, as well as tenets of the Taoist and Buddhist philosophies that are sprinkled throughout the work. Lee Mikeska Gardner is a skilled director but in this case it’s hard to know what she can do about the fact the production checks in a two hours, 45 minutes including an intermission, and that could be a bridge too far for many younger theater-goers. If that’s the case, the Underground Railway Theater, as mentioned before, is also restaging a production in its Studio Theatre that includes two short plays: “Matchless,” by “Wicked” author Gregory Maguire, derived from the story of “The Little Match Girl,” and “The Happy Prince,” by Oscar Wilde, directed by the URT’s Debra Wise. Both pieces are just over an half-hour with a short intermission, are suitable for all ages, and include some very creative staging and positive holiday messages. The Nora Theatre Company and Underground Railway Theater production of “Journey to the West.” Adapted by Mary Zimmerman from the translation by Anthony C. Yu of “Hsi Yu Chi.’’ Directed by Lee Mikeska Gardner. Presented by Nora Theatre Company and Underground Railway Theater at Central Square Theater, Cambridge, through Dec. 31. Tickets: $16-$67. 617-576-9278, ext. 1. CentralSquareTheater.org. 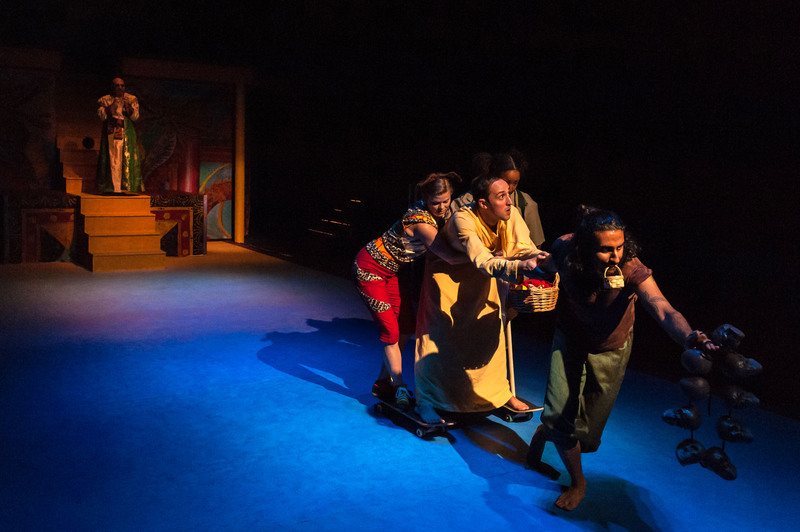 (From Left to Right) Thomas Derrah, Lynn R. Guerra, Shanae Burch, Jesse Garlick & Harsh J. Gagoomal in JOURNEY TO THE WEST. Photo: A.R. Sinclair Photography.